Meditation center founded by Tibetan teacher Losang Samten in 1991, consisting primarily of Caucasian practitioners. The center is located in North Philadelphia. On average, the center attracts about thirty attendants per session. When we visited, the ratio between males and females seemed roughly equal. Caucasians made up the majority, although there were African Americans and Asian or Asian-American practitioners who together made up around 20%. In terms of age range, there are more middle-aged adults practicing and a lack of younger adults present. The spiritual leader of the temple is Losang Samten, a renowned sand mandala artist who frequently constructs sand mandalas dedicated to Bhaiṣajyaguru, among other deities. He does not claim to do these as healing rituals, but rather as a way of sharing and educating about traditional Tibetan art forms. The center teaches a guided visualization meditation on Green Tārā, a Buddhist deity whose color symbolizes strength and activity. 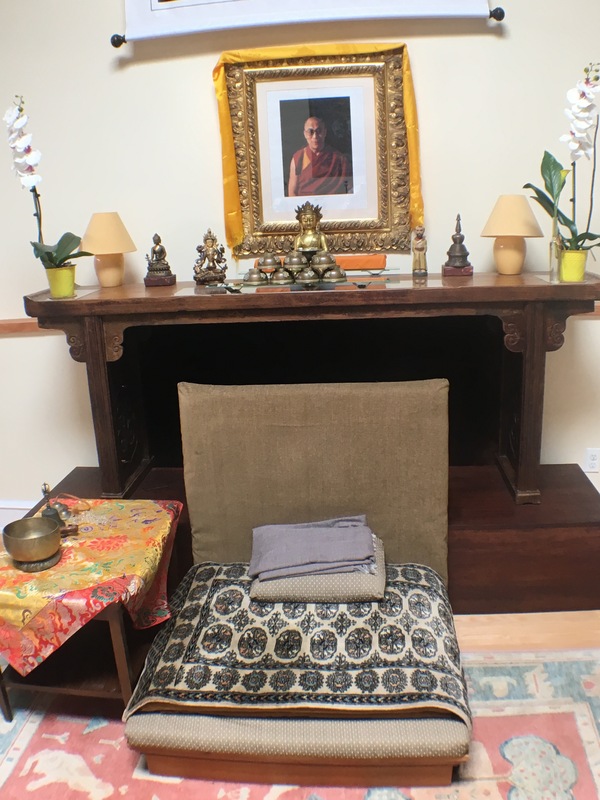 Her image is placed in the center of the altar in the devotional space where the meditation takes place. She is often depicted in art sitting on an open lotus flower with her legs extended ready to spring into action, and surrounded by gold ornaments. 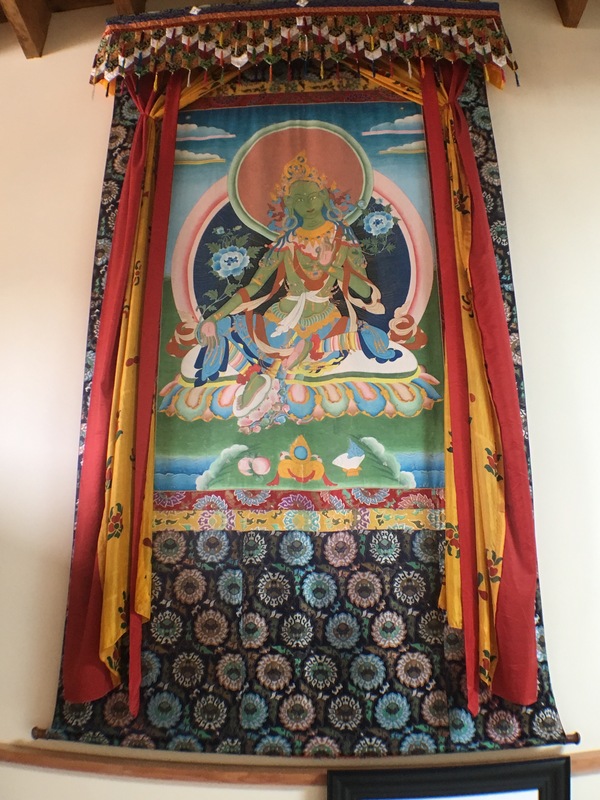 It is believed that by visualizing the Green Tara during this practice, she will help devotees clear obstacles, remove fear, and relieve their physical, emotional, and spiritual suffering. An important aspect of this meditation is the visualization of the symbol TĀṂ, which is the “seed syllable” of Tara. This symbol is visualized above the meditator’s head. Practitioners are guided to also visualize all of the chakras of their body aligned in sequence along the spine, neck, and skull. After the symbol of TĀṂ and the chakras are aligned, practitioners visualize white light flowing through all of them. Although during the gathering the leader offered insight mainly into the importance of this practice for spiritual growth, he also explained the benefits of meditation by associating the practitioner’s posture during meditation with a calmer nervous system and an improved musculoskeletal system. In addition to visualization meditation, attendees also chant a variety of mantras. 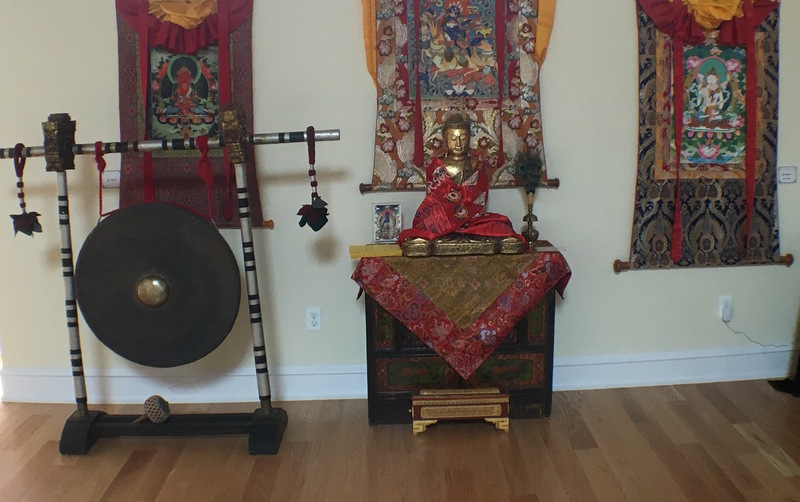 Practitioners believe that through the practice of chanting of the Green Tara mantra they are able to cultivate qualities such as love, wisdom, and compassion. They claim to become more compassionate toward themselves and others, as well as to be able to better take care of their body and mind. 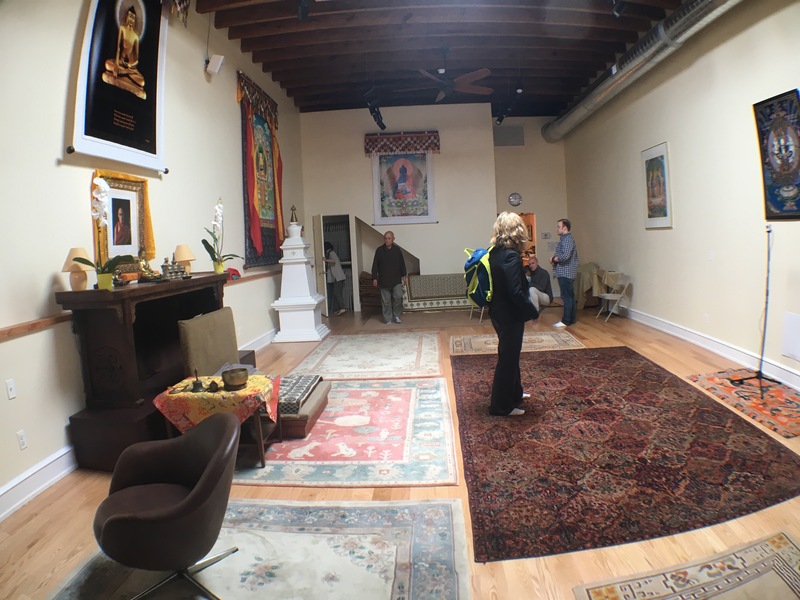 NBC News article about purchase of new building for Chenrezig.